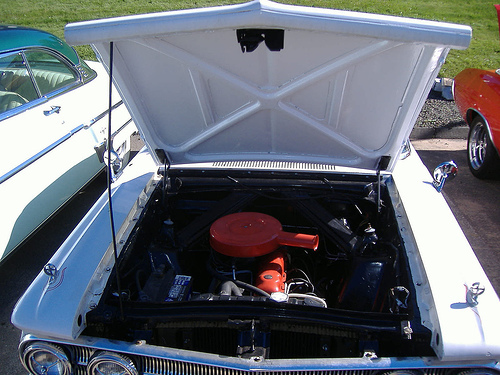 This page documents my converting my 1962 Mercury Comet 170cid inline 6 engine from a 30 amp generator & mechanical voltage regulator to a 60amp alternator and solid state voltage regulator. This conversion should work for any 1960, 1961, 1962, 1963 or 1964 Comet, Ford Falcon, or Ford Ranchero with the 144cid or 170 cid I6. I couldn't have done this conversion without the helpful advice of the people on the Ford Falcon News Forum. I put this page together mainly to gather together the info I garnered there and from various websites and forum threads, as well as documenting my own discoveries and issues with the conversion. Hopefully you will find this useful if you do the conversion yourself. NOTE: A alternative to this is now available. Falconparts.com sells a bracket kit that allows you to bolt up an alternator without replacing the timing chain cover. If you use that skip down to the "Wiring" section below. To start, let me explain the conversion. 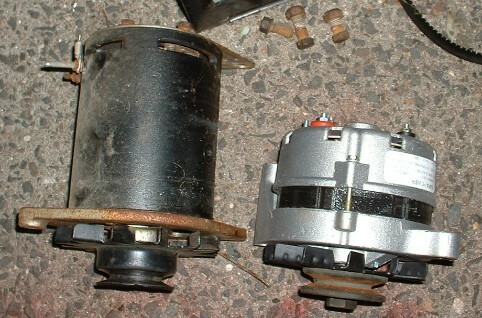 I'll be converting the car from the earlier ('64 and earlier) generator to a later (post '65) alternator. The nice things about this conversion vs the one wire alternator conversion is that it uses all stock FoMoCo parts. So a)it's easier to get replacement parts in the future as things wear out, and b)unless the people looking at it know classic Fords well, the conversion looks stock. To do the conversion you're going to need parts off a donor vehicle, as well as some new ones. Your donor vehicle can be most any 1965 and later vehicle with the 144, 170 or 200 cid I6's. I got mine off a '76 Maverick 200cid at a local junkyard. The part numbers given may or may not be correct, they were simply the best I could decipher from 28 year old junkyard parts. 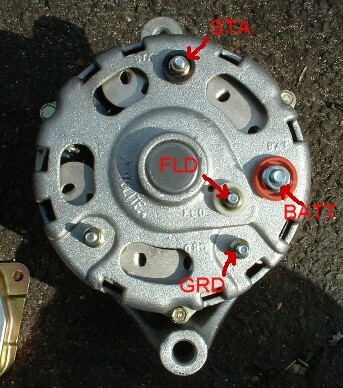 single-belt alternator pulley This may or may not be needed depending on the alternator you get. The one I got from NAPA had a dual-belt pulley, the guy said the remanufacturer does that so it'll work for 1 and 2 belt applications. I had them change the pulley because I thought the extra belt groove would look dumb on my I6 with only one belt. Turned out to be a very good move, as there is only about a 1/4" of clearance between the fan blade and the pulley bolt. 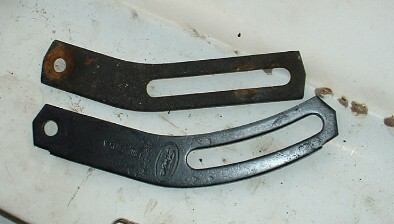 The two belt pulley would have rather violently interfered with the fan. Alternator & voltage regulator wiring connectors But only if they are in good shape. I pulled the ones off the maverick only to discover the connector for the VR was badly rusted and corroded, so I used a Napa connector (see below). All hardware If you are pulling these parts yourself, snag every bolt you remove. This makes things much easier during re-assembly if the new piece requires a different bolt than the old one. Alternator Ask for the one that matches your donor car, or ask for the one for a '76 Maverick. That is the one I used and it worked perfectly. 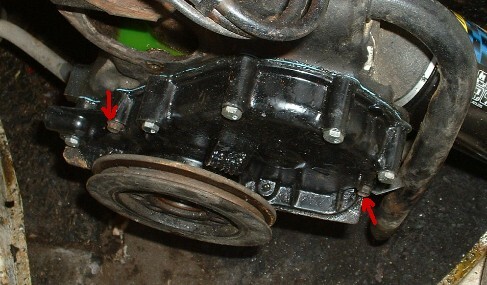 Also see the note above regarding the single-belt pulley. Voltage regulator Make sure you get a solid state VR, the mechanical ones are prone to problems from dust, moisture and vibration. Once again asking for one for a '76 Maverick will get you the right one. Belt It's cheap insurance, ask for the one for the donor car to insure proper fitment with the alternator. New 1895 bulb for idiot light Again cheap insurance. Mine was burned out, and without a working bulb in the circuit the car wouldn't charge, new bulb and it worked perfectly. five 1/4" x 2" coarse thread bolts If you didn't get the hardware from the donor car you will likely need these. Five of the seven original timing chain cover bolts are too short for the new cover. harmonic balancer puller If yours doesn't include them, you'll need three 3/8" coarse thread bolts (about 3" long) to match the threads on the harmonic balancer. The beginning, as this photo clearly shows, you're going to need to take out the radiator to get at the fan bolts, and to have room for the harmonic balancer puller/installer. 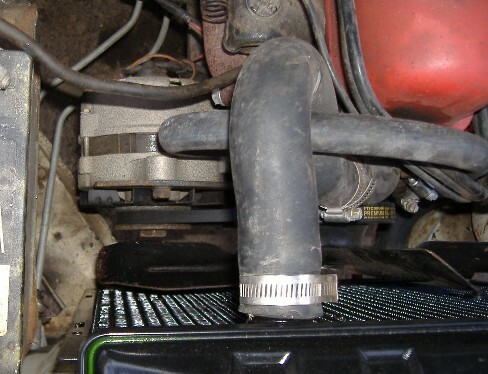 removing the lower radiator hose is also a necessity. 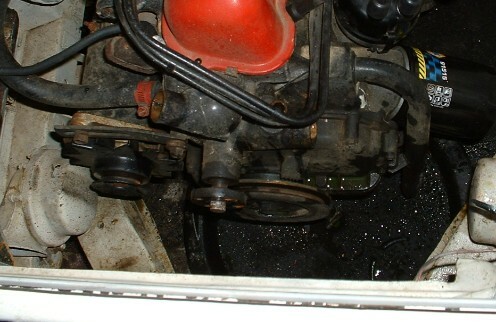 If you've been considering replacing the water pump, this is a very good time to do it. You can get a rebuilt one for under $20, and having it out makes this job much easier. I happened to be replacing all the coolant hoses, water pump and thermostat while I did the conversion so you'll see all those removed in the later photos. Please ignore the random red & white bits of the engine, the last owner tried to make the engine match the interior, I've since fixed that. 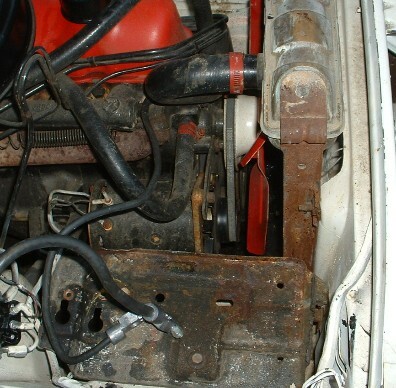 radiator, fan, fan pulley, belt, and hoses removed. 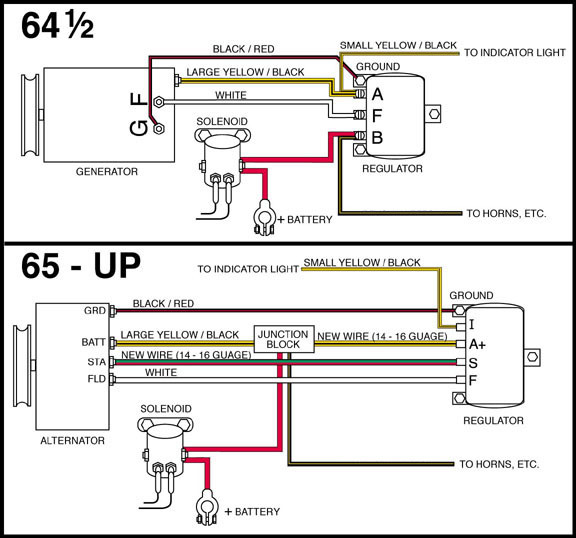 Alternator and generator comparison. Half the size and twice the amperage, not bad. 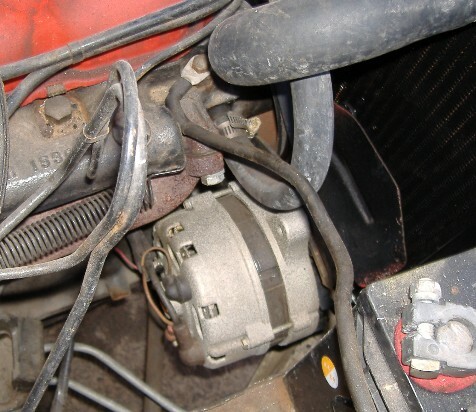 You can see that the alternator uses a much shorter set of mounting holes than the generator. It also sits slightly further forward on the engine. Generator and lower bracket removed. 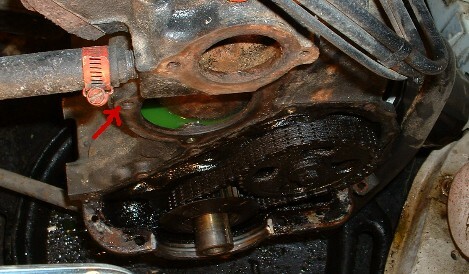 the arrows show the generator lower bracket mounting holes, the front one will be re-used by the alternator, along with a bolt hole on the new timing chain cover. 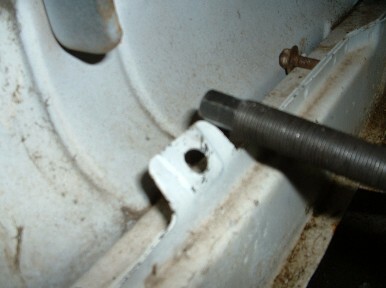 On my '62 Comet, this tab at the bottom of the radiator opening interferes with the harmonic balancer remover and installer. I bent it down with a hammer, but you may want to consider less violent ways of working around it. Harmonic balancer and timing chain cover removed. 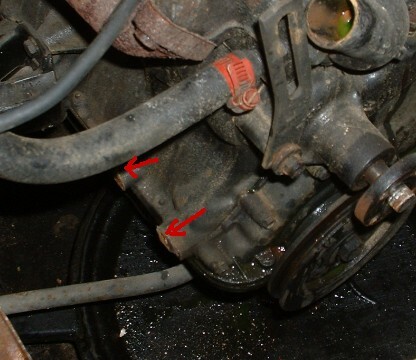 The bolt hole indicated is for the bolt shared by the water pump and upper alternator bracket. Mine was only about 4 threads deep (possibly due to an old snapped-off bolt in it). I ended up drilling it out and tapping it another 1/4", and buying a new longer bolt to ensure it was up to holding the alternator. Be careful if you do this that you don't drill through into the water jacket. 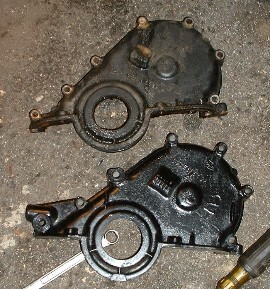 Old and new timing chain covers (the new one is the shiny black one), you can see the new tab on the left end for the alternator bracket. 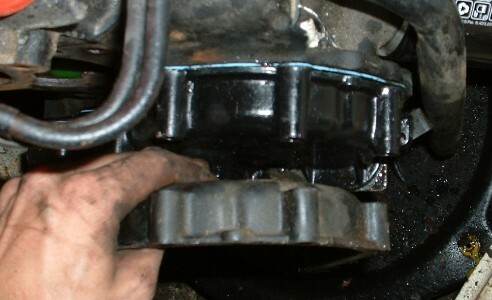 Another unforeseen problem, the new timing chain cover uses longer bolt holes for five of the seven bolt holes, necessitating longer bolts as mentioned above. Timing chain cover installed with new bolts. The arrows show the two old bolts, the only ones that still fit. 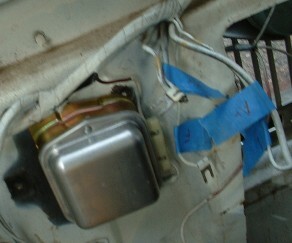 Upper generator and alternator brackets. 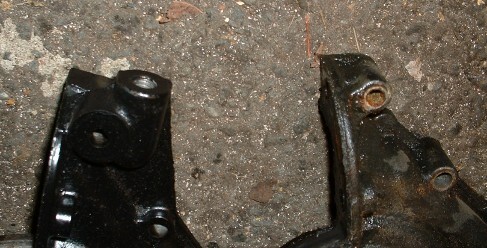 The alternator bracket (lower) is a different shape, and has a longer arc to it. 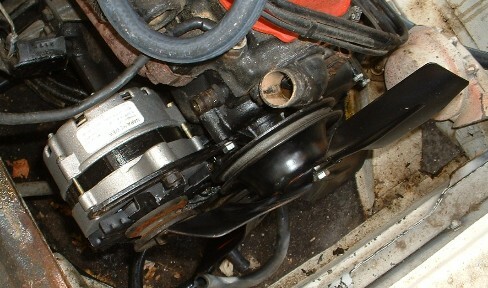 Alternator installed and fan & fan pulley installed. You can see the tight clearance between the alt pulley and the fan blade. (found on the web, not mine) This is the wiring diagram I used to wire everything up. 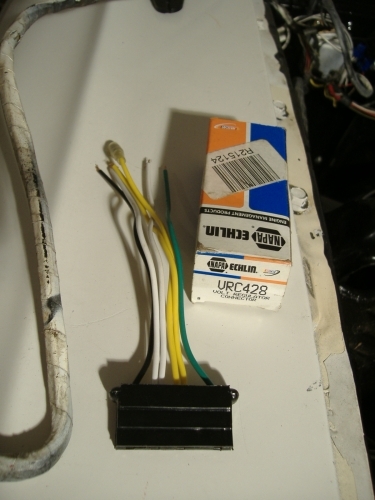 The basic idea was right, however my '62 Comet had different color wires for the F->F wire (black w/white stripe), and had an addition wire at the B terminal which headed off into the wiring harness (which I simply wired in along with the stated 'to horns etc' wire). 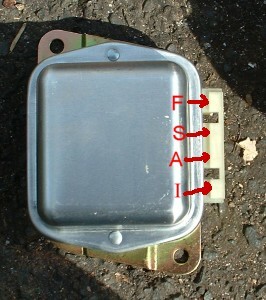 Alternator and voltage regulator with terminals marked. In case yours are unclear or hard to read. 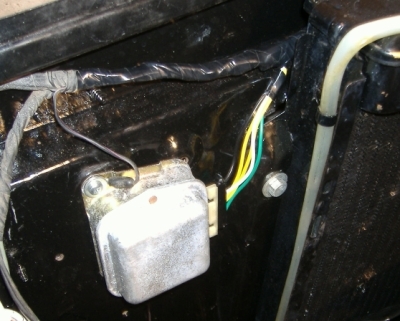 New solid-state voltage regulator installed in place of old mechanical one. I had to drill a hole for the top screw, but the bottom one is from the old VR. You can also see the wiring from the old VR marked with where it'll be going on the new one, this saves getting confused later. 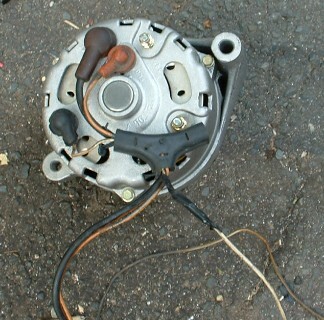 Alternator with Maverick wiring harness installed. Alternator with everything fully re-installed & wired up (these pics were taken much later thus things not looking brand new). Voltage Reulator mounted and wired. The wiring was a bit of a pain, but fairly straightforward. I just did it one wire at a time and checked and re-checked my work to ensure nothing was crossed or forgotten. After everything was in I started her up, and she wasn't charging! After re-checking wiring and testing wires for breaks, I eventually remembered someone on the forum mentioning that the charging circuit needs the resistance of the idiot light bulb to function properly. I checked and mine was burned out, I replaced it and she worked great. That's all the info I have. If you want to do this conversion and have questions I'd strongly suggest asking the folks over at the Ford Falcon News Forum, they're very helpful people (I'm on as 'improbcat').